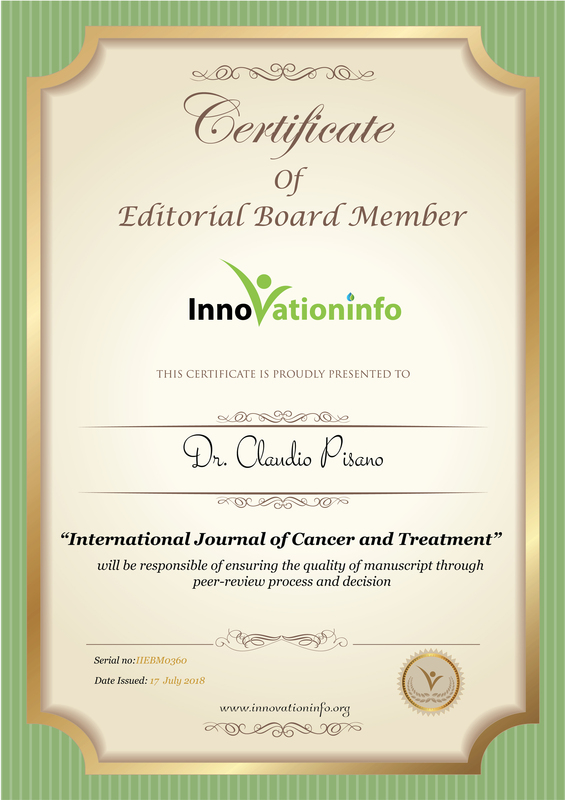 Designation: R&D, Director of Medicinal Investigational Research (MIR), Italy. Research Interest: Genetic and Molecular Biology, Oncology. Biography: Dr. Claudio Pisano is a R&D, Director of Medicinal Investigational Research (MIR), Biogem, Ariano Irpino, Italy. He received his PhD in Genetic and Molecular Biology, “Centro di Genetica Evoluzionistica”- National Research Council (C.N.R. ), Dept. of Genetics and Molecular Biology - University of Rome “La Sapienza” Rome (1985-1990). Master’s Degree in biology University “Federico II”, Naples, Italy in 1984. He worked as a Director of Oncology Department at Sigma Tau Pharmaceutical company, Italy from 1997 to 2012 and Staff research scientist at “Centro di Genetica Evoluzionistica”- National Research Council (C.N.R. ), Dept. of Genetics and Molecular Biology - University “La Sapienza”, Rome from 09/1990-12/1996. He published more than 130 papers in different journals.